Becoming a big sister is extremely important to a little girl. She's so excited about the new baby coming and wants to help do her part. Encourage the fun with a personalized big sister gift set for the oldest sibling. Why should newborns have all the gifts? Keep your big sister happily involved with a personalized sibling gift set just for them. She'll love to show off her t-shirt to everyone at the hospital. 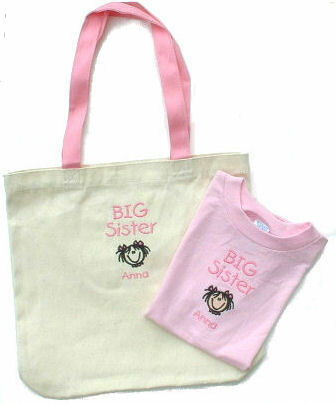 Don't forget the personalized big sister tote bag that she'll be proud to carry with toys and books to keep occupied. Great gift idea to keep big sis in smiles!